Liz & Chris are no strangers to the Pearls Events blog. You may remember their super adorable lifestyle engagement session, or possibly their wedding recap post...yep, we loved working with them in 2010! Pearls Events was hired on an hourly basis to provide consulting after meeting Liz at GRunveiled 2010. We helped the couple find their perfect ceremony location and were also available to bounce ideas off of as far as ceremony set-up options and logistics on the day-of. It was fabulous working with Liz & her mom, and we wish Liz & Chris nothing but the best! As you can see from the article above, Liz's gown was her number one priority, besides marrying Chris, the love of her life! Here she shares all the budget details that helped her stretch her $20,000 budget to include spending 31% of her overall budget on her amazing Vera Wang gown. And as you can see, it was an absolute show-stopper and I know her groom couldn't keep his eyes off of her that day. 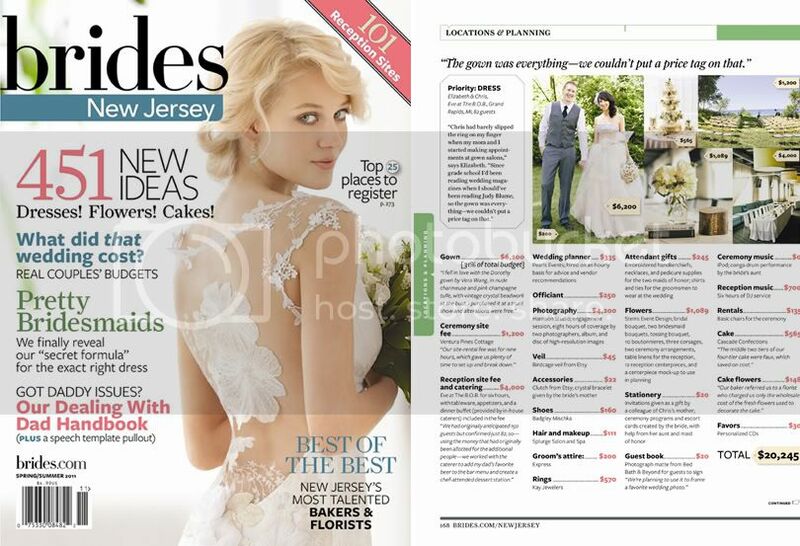 A HUGE thank you to Cassandre of Cassandre Snyder Events for sending the images of the Brides New Jersey my way. The article will be in Brides Michigan come mid-March, but it also got published in other Brides regional editions as well, which is quite awesome! Congratulations to Liz & Chris! I hope their budget breakdown helps some of you brides-to-be planning out there.